The Rumpus is an online magazine that publishes essays on eclectic subjects. They asked me to illustrate one called In My Clothes. In it, a woman looks back on her life, musing on what she was wearing at the time. You can read it here. This is the third and final post on this assignment. The first referenced child movie star Shirley Temple, the second MTV video icon, Robert Palmer. I touch my braids, wrapped around my head like a milkmaid. I feel silly. And then there is my Little House on the Prairie dress. All the references to clothes in the essay made think of paper dolls. I may have gotten a little carried away with the braids. The milk can and cat bracket the main elements, and give the illustration some extra appeal. I am forty-three, and I am getting married today… There is small cake from Wal-Mart with an orange sunflower on top… We eat bowls of fried rice in the living room and we say, I love you. I knew there was a wonderful illustration in there as soon as I read the lines. I substituted a takeout box for the bowls of rice, because, for me, Chinese food is very much identified with those boxes. And little packets of soy sauce. 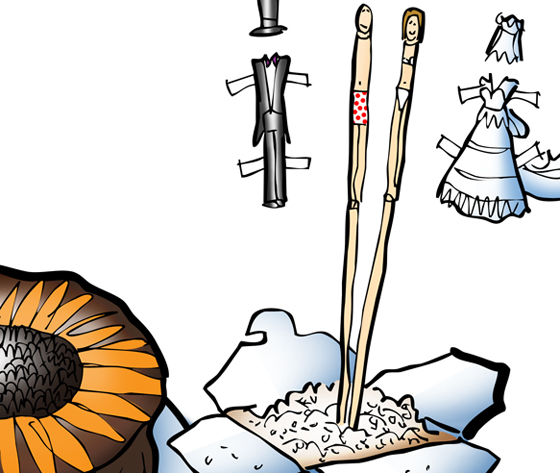 I had envisioned a pair of ordinary chopsticks, but as I roughed out the line drawing, it occurred to me that I could do something a lot more creative, which would also allow me to extend the paper doll motif. We all have vivid memories of certain events. Do you have any where you can remember exactly what you were wearing? Did anybody play with paper dolls when they were young? I remember seeing paper doll outfits in comic books. They’d be credited to the readers who sent them in. Were you one of those budding fashion designers? Has anyone ever eaten sunflower cake? Do the little seeds get stuck in your teeth?? Draw A Rough Sketch First: It’s The Thinker Thing To Do!! That Horse Coulda Been A Contender! 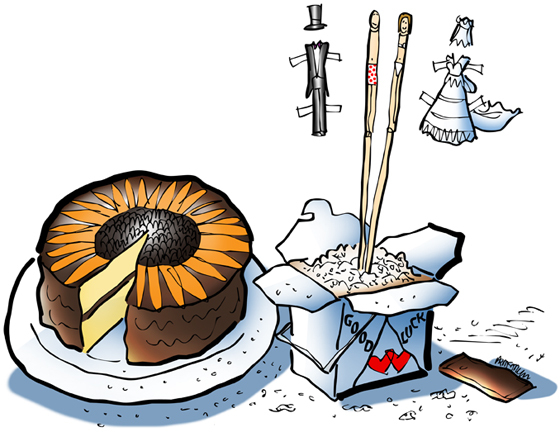 I love those scantily clad chopsticks. That was an inspired stroke of genius. I actually have a pretty amazing memory for the visual. I can’t remember my own phone number but I can tell you what I was wearing 35 years ago when a particular thing happened. I wonder if that’s a common ability or not. I do remember having paper dolls but not playing with them. I was a tomboy and was into competitive marble playing. I, therefore, recollect swapping a brand new paper doll book for a pocketful of large sized marbles when I was about 7 and getting into trouble for not seeking parental authorization before conducting the swap. I was wearing brown cord dungarees and a checked shirt at the time, I kid you not. I love your story about swapping the paper doll book for the marbles– that’s a classic! I’m sorry your parents didn’t appreciate your entrepreneurial spirit. I’m astounded you can remember your clothes at the time. But dungarees and checked shirt sounds like my childhood– and every kid wore some variation of same. Brand names? Phooey!– back then, “generic” and “anonymous” were cool! Now I know what Heidi looks like all grown up. It’s alles gute to partake of your talent and crazy humour! High on the 3rd floor, this Indian goat heard….leh-yodel-ah-yodel-ah-ee-ooh…..! Unlike you, dear Arm-Uncle, who lives on acreage (ahem, I recall a holy interview), my condo peeps overheard the Heidi-ous sound as I opened AGF’s hard but winning round even if Canada Customs turned up its nose at the pong….baaa-ite me! Since you’ve blown my zen-soul cover what with my delightful havoc-wreaking abilities, all I can say in gratitude (Thanksgiving weekend here) is: Off with her zen ! 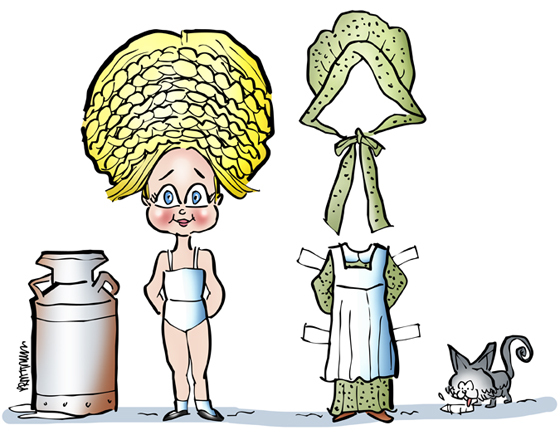 P.S: Heidi brought out the Sinéad in her…..baldilocks, eh? Mark … I love how your creative mind works. The gal with the H-U-G-E hairdo reminds me of Dolly Parton. Adorable. Just inspired! The chopsticks – too cute. And, no, I’ve never had sunflower cake. I didn’t play with dolls or paper dolls much when I was a kid. I was a tom boy. I do remember one outfit when I was in elementary school – a brown corduroy skirt and vest. Very snazzy at the time. A few others stand out from my high school years, but not all in a good way. From now on I’ll refuse to eat with naked cuttlery, you’ve opened my eyes to how barbarous that behavior is! 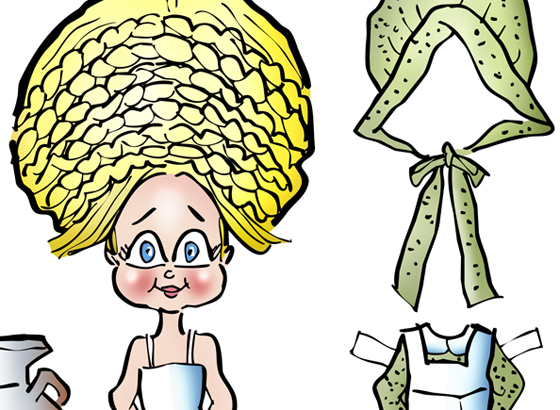 I love your milkmaids hairdress and would like to order a paper wig in my size! I did play with paper dolls…I remember cutting out the outfits and putting them on the paper doll …cutouts all from a book that could be bought. I love the braids, the dress, paper dolls and hmmm Chinese food! Your kind words make me swoon. Maybe I’ll be lucky enough to fall into a vat of chocolate donut glaze… SPLAT!! Mmmmwahhhh! !